Bullion Exchanges offers this impressive 1 oz PAMP Suisse Rhodium Bar .999 Fine (In Assay). Rhodium is one of the rarest metals in the world, found in relatively small amounts, the annual world production of the element is only seven or eight tons. Due to the excellent metal quality and uniqueness, this Rhodium bar has high demand on the precious metals market. 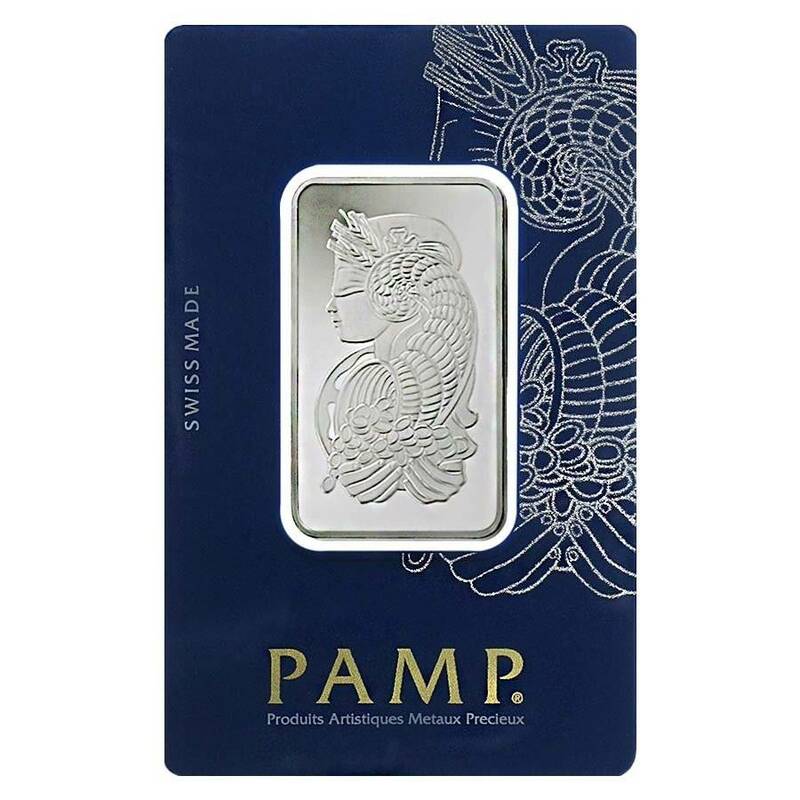 Product of a premier bullion brand in the industry - Swiss refiner PAMP, this bar is highly valued among collectors and numismatic enthusiasts. This beautiful bar features the Greek goddess of luck - Lady Fortuna. They say, Fortuna has so many different meanings and associations in Ancient Rome’s history. This Goddess is personification of wealth, luck, prosperity, generousness. Each bar contains 1 troy ounce of .999 Fine Rhodium. Bar made from extremely rare and unique metal. Minted by universally admired Swiss refiner - PAMP. Obverse: Features the blindfold Greek goddess - Fortuna, with riches flowing in her hands. Reverse: Showcases all the general bar information - bar weight, purity, unique serial number with the PAMP Mint logo above. Individual bar is sealed in Assay card with Certificate Assayer’s signature. 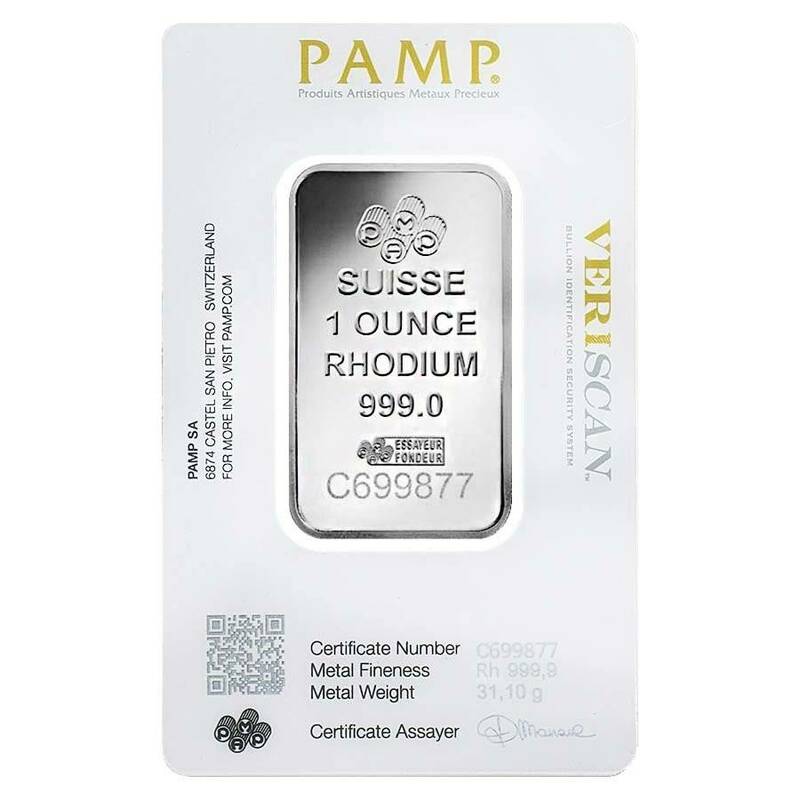 Why should you buy 1 oz PAMP Suisse Rhodium Bar .999 Fine (In Assay)? Rhodium is one of the rarest elements on Earth, meaning it’s highly desirable ingot to investors and collectors. Rhodium is a relatively inactive metal. It is not attacked by strong acids, that makes this bar very competitive on the bullion market. You can diversify your investment portfolio with really relevant and unique product. Rhodium bars are great way to start your long - term precious metals investment. PAMP has an excellent reputation for quality. Rhodium is a hard, silver - white colored and very rare chemical element that belongs to the platinum group. It is highly reflective and durable. Rhodium’s strength and durability make it a useful alloying metal. It’s often used to catalyze industrial processes. Rhodium is incapable of being attacked by the majority of acids. It doesn’t dissolve with nitric acid and only slightly dissolves with aqua regia. Even when heated, rhodium rarely forms an oxide. Also, rhodium is considered to be non - toxic metal. Most metal producing (87%) goes into catalytic converters for cars.The major use of the metal is in alloys with platinum and iridium, giving improved high - temperature strength and oxidation resistance. Also rhodium is highly used to plate jewelry, due to its brilliance and resistance to tarnish! Over the years rhodium has been a symbol of wealth, to bestow honors and, more commonly, when popular metals like gold, platinum or silver are inappropriate. 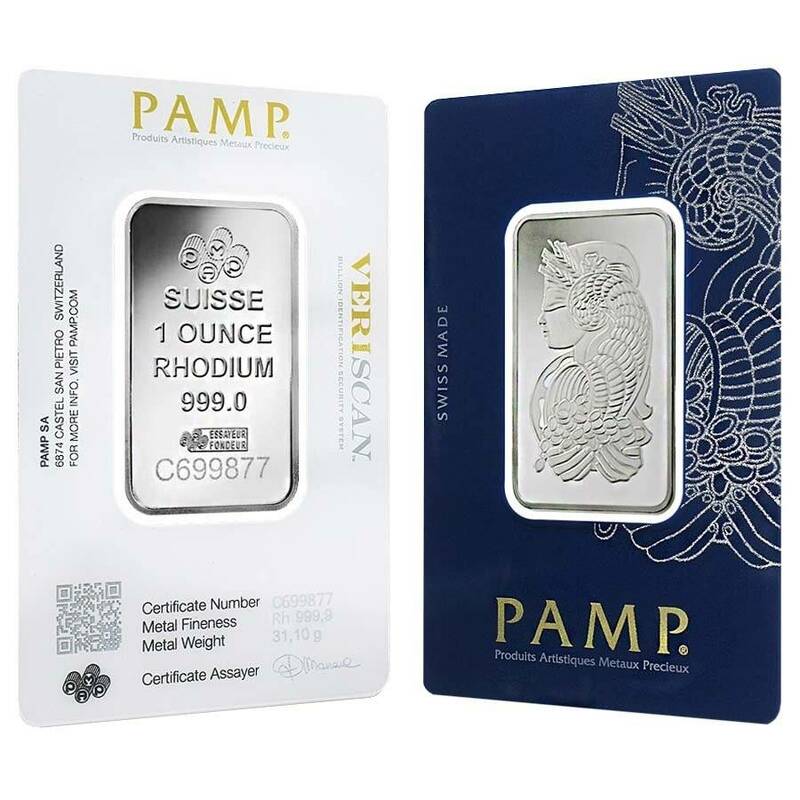 With its impressive design and metal uniqueness, the 1 oz PAMP Suisse Rhodium Bar .999 Fine can be considered as a timeless piece of the precious metals, that would undoubtedly contribute to both the value and artistic diversity of any collection. Great looking coin, nice price over spot! I ordered my first Rhodium bar and boy is it gorgeous! Good Job! Unique! PAMP always super high-quality bars and this rhodium piece is the newest thing! I am very happy with the quality and look! Incredible Mint condition! PAMP bars are international bestseller. Bullion Exchanges has a very competitive prices! I always find the best deals here! One of my favorite brand! Awesome bars!! When I took notice of Bullion Exchanges new offering, the 1 oz PAMP Suisse Rhodium Bar I had to buy it! Its rare to see this metal sold anywhere so I was happy to purchase a few. My order came in just two days and expertly wrapped. Thanks so much for unique pieces like this BE! Thank you Bullion Exchanges for this amazing Rhodium Bar from PAMP! I was looking for something exclusive on the market and you got me! Will be waiting for new unique products. 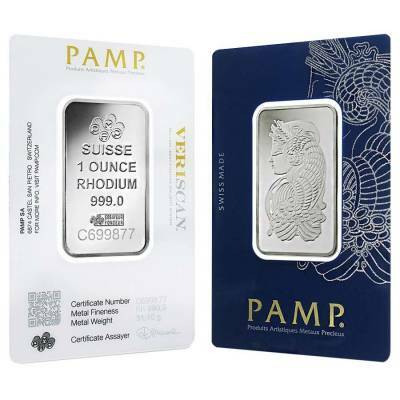 I was thrilled to see that PAMP now offers 1 oz PAMP Suisse Rhodium Bars! I contacted Bullion Exchanges to ask a few questions, and to place my order. I must say their CSR's are knowledgeable, friendly, and quick! My ordered arrived in just 2 days, and the bar was in immaculate condition! Thank you Bullion Exchanges, for the phenomenal pricing, superb customer service, and record breaking turn around! I will be back to purchase more of these bars and your Canada the Great 10 oz Coin! The quality of this bar is simply AMAZING! Per usual, Bullion Exchanges had my order to me in just 3 days time and it was packaged perfectly. Thank you, guys! Ordering online was simple with your easy to navigate website. My 1 oz PAMP Suisse Rhodium Bar came perfectly wrapped and in just three days. Thanks so much BE! With this purchase, you earn 3152 Bullionaire Bucks 3152 BB = $3.15. We currently have 914 of this item in stock. For every $1 spend, you will earn 1 Bullionaire Buck which is equivalent to $0.001 off a future purchase. 3152 BB = $3.15.